Tooth whitening treatment is one of the most popular cosmetic dental procedures in the world. It is a safe, fast and effective way to give your smile a boost and, because treatment time is so short, is perfect in the run-up to a special occasion such as a wedding or business presentation. They key thing to remember if you are looking for tooth whitening treatment is that it must only be carried out under the supervision of a qualified dentist. Many websites and even beauty salons offer teeth whitening products, but these are unregulated and will at best be a waste of money as they have no effect on your teeth. At worst, they could do serious damage to your teeth, gums and surrounding structures. At Leamington Spa Dental Practice, our tooth whitening treatments use well-known, respected brands and are tried, tested and safe. Before any tooth whitening treatment, your dentist will carefully examine your teeth and will check your medical history. While tooth whitening is suitable for most adults, there are certain circumstances under which it should not be carried out. For example, if you have underlying tooth decay or gum disease, this will need to be treated first, because tooth whitening must only be carried out on healthy teeth. We use the Enlighten and Pola brands of tooth whitening treatment, and offer both in-practice and at-home teeth whitening. Enlighten is the only tooth whitening brand to guarantee a B1 shade of brightness. 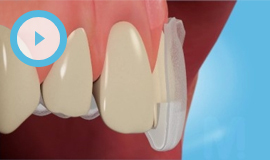 Treatment can be carried out at home, using custom-made teeth whitening trays that are made to fit your teeth perfectly, combined with whitening gel; or with one or two sessions at the practice. For home whitening, you will need to put a small amount of gel in the trays and wear them overnight for two weeks. For in-practice teeth whitening, you just need to sit back and relax while the gel gets to work.